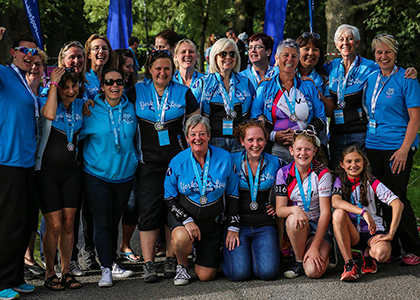 Meet the Yorkshire Lasses Cycling Club, a club that epitomises women that like to cycle, socialise and have some fun on two wheels. The club was set up by Kate Horsfall and Judith Worrall, two good friends who wanted a club just for women, run by women, to encourage women to get out on their bikes have fun, get fit, meet new friends. All with a bit of cake indulgence thrown in! 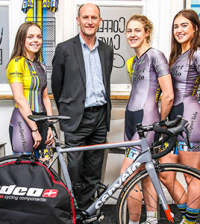 The club was set up in March 2015 with the support of Tony Booth and All Terrain Cycles Wetherby, and within a few months already had 60 members signed up. 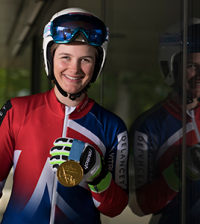 This was way above any expectations that Kate and Judith originally had, and highlighted just how many women were getting back into the sport. 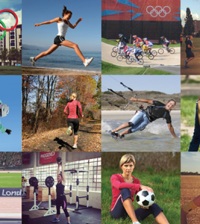 The secret to the club’s success is that they are just all everyday women with busy lives, family and work commitments, rather than super fit athletes, chasing stats and trying to keep up with each other. Two years in and the club is going from strength to strength, with 131 members to date. With a wide range of different abilities the club tries to mix up the kind of rides on offer, so there is something for everyone, from sportives, club rides to mountain biking. Beginner rides also offered for those who have been off the bike for a few years and want to start building up the miles and the usual Sunday rides offer different route options (by mileage and elevation) and always try to meet at the same cake stop when routes permit. 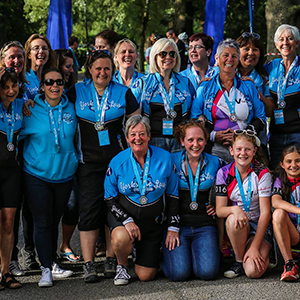 In 2016, the Yorkshire Lass Cycling Club held their very own women only Charity Sportive and raised £14,500 for Women V Cancer – an amazing cause that supports Breast, Ovarian and Cervical Cancer Charities. 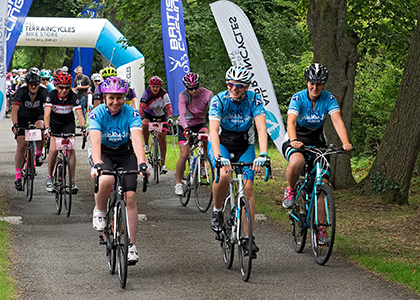 This year’s charity sportive will be taking place on the 20th August at Carlton Lodge Activity Centre, Thirsk, supporting Women V Cancer, Yorkshire Air Ambulance and Carlton Lodge Bursary Fund. 30 miles – Cuppa tea and a piece a cake, for ladies who are just starting doing sportives, flatish route. 60 miles – Rite gud ride, for ladies who are ready to go that bit further with a couple of hills thrown in. 103 miles – By eck that wa ard ride, for ladies who are ready to try for their 1st milestone 100 ride with hills thrown in. There will be a medal for each participant and more importantly a cuppa and a piece of cake when you finish your ride.